Monogrammed baby layette set. Light pink sleeper gown and matching receiving blanket with embroidered initial monogram. Baby shower gift. The perfect baby shower gift! This monogrammed layette set includes a light pink sleeper gown with a matching receiving blanket. Each item is beautifully embroidered with a 3 letter monogram in a darker shade of pink. *** This set is also available in white or blue. - Baby girl's monogram in this order: First name initial, Last name initial, Middle name initial (fLm) as that is the order that it will be embroidered in. Thank you for visiting Gentry's Closet! Monogrammed baby blanket. New baby present with monogram. Custom embroidered baby blanket. Cotton baby receiving blanket with initials. Cute monogrammed Spring shirt. Girls boutique shirt with monogram. 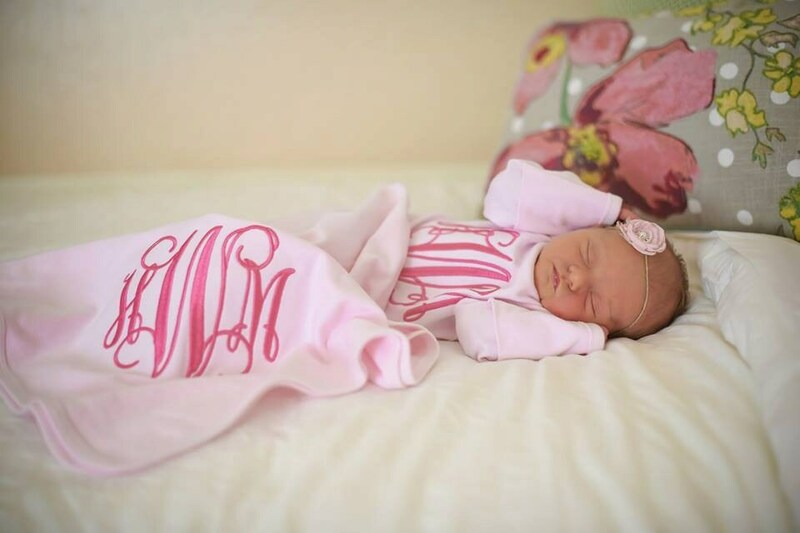 Pink monogrammed baby clothes. Girls tshirt with monogram. Baby shower. Ruffled burp cloth with monogram. Boutique baby clothes. Baby shower gift. Burp rag with ruffles and embroidered initials. Monogrammed Baby blanket. Seersucker pink baby girl shower gift with embroidered name. Monogram. Newborn pictures. Personalized baby gifts. Ruffle bib with monogram. Embroidered baby shower gift. Personalized new baby present. Cute burp cloth with initials. Baby girl gift. Girls' Customized Pink and Gold Valentine Heart Shirt. Valentine's Day shirt with personalized name. Valentine's Day Double Hearts Embroidered Shirt. Appliqued Ruffle shirt for Valentine. Easter shirt - Chevron Easter egg with large bow and personalized name. Monogrammed Easter outfit. Easter shirt with name for baby, toddler. Sweetheart Valentine's Monogrammed shirt with Heart. Valentine shirt or infant bodysuit for little girl. Pink and Red Hearts.